Tainui 4 was written on my hand, and as I was looking for the exact same words on the walls of the hall, I was frightened from behind by Tyler Baker. She happened to be in the same group as me. So we sat down and were waiting impatiently for our team leader Jarna to lead us off to our first destination. Today the students from years 6 to 8 all gathered in the hall. Ready for a whole first block of fun filled activities, related to the 2012 Olympics. 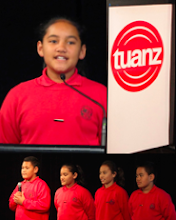 Tainui 4 headed off to the street, the year 7 and 8 block. There we would be doing something alike to zumba with Mr Slade, but more slower. After we had finished doing that activity we moved along to the Music room, where we would be watching just the beginning of The Toy Shop production we did in 2009. As I sat down straight away I saw my good friend Huelo-Ata as a little girl. Then out popped Julia who was the mother of Joshua, but in the Production. And then a shocker, out popped everyone, and from the corner of my eye I saw myself as a little girl. Our next activity was in the Library, with Mrs Flavelle. We were going to be decorating cookies with icing, and seashells with felt tips. The cookies were left for one side of my team to decorate and the seashells were left to me and my side to decorate. It was a tough challenge because we were vs Taki 2, and from what they have produced by half time was pretty good. But we got back into the game and were decorating as fast as we could, and putting in a lot of creativeness that we had into it. In the end my teams result was much better than I had predicted it to be. After that activity we moved onto doing Jump Jam in room 17 with Miss Muliaumaseali’i. Our first song we did with her was this song that is in the movie Rio. Then later on after 2 more song,s we had a freestyle competition. I obviously entered it, to get our group more points. By the end of the freestyle round we, Tainui, had scored up to 70 points. Me and Patrick scored the most. And Taki 2 scored quite a bit too. Then kicked back and listened to the song I believe in the movie Honey. Then after that song, we had to retreat right back to the hall, ready to watch PENN. At the end of PENN, they played some movies, that we had made when we were really young. It was a shocker! Then it was time to depart. The whole morning block was packed with fun. And I had the most. Hopefully we could do it another time, because it was really cool.